Once upon a time, long, long, long ago there lived a sage called Krishna-Dvaipāyana Vyāsa, who wrote a famous, very famous epic called Mahābhārata. Almost everyone in India knows at least something about this book, whether or not they may have read any part of it in any translation or version. But how many of us know something, I mean really know something, about the women of Mahābhārata? Other than some well-known facts that Draupadi had five husbands or that Kunti was the mother of Pandavas or that Gandhari blind-folded herself for life the moment she learned that she was married off to a blind man without her knowledge, most of us hardly know anything about these women. And these are some of the well-known women from the epic. Even then we know them in only sketches, we know them only through popular portrayals on TV or in films or popular literature. Most of us don't even know anything about Suvarchala or Sulabha or Madhvi or Uttara-Disha. We may have heard a little about Savitri, Damyanti, Devayani or Shakuntala, but again we know them only through their caricatures. For example, we may know more about Kalidasa's Shakuntala than the one in the Mahābhārata. How are the two different? And what does that difference tell us about the time and context in which the two stories were told? Which story holds greater truth, as relevant for today? Do we know these women as teachers of mankind? As the Mahābhārata might have intended to present them to its readers. My weekend after Diwali was well spent reading from start to finish (and then re-reading some of its chapters) a 265-page book titled, The Women of the Mahābhārata: The Question of Truth (2008, Orient BlackSwan Publishers). This was one of the most interesting books I have read in the last few months. The author of this book, Chaturvedi Badrinath, recipient of 2009 Sahitya Akademi Award for his monumental work titled, The Mahabharata: An Inquiry in the Human Condition, was a philosopher by education and worked for many years in the Indian Administrative Services. In the stories through which the Mahabharata speaks of life, women occupy a central place. In living what life brings to them, the women of the Mahabharata show that the truth in which one must live is, however, not a simple thing: nor can there be any one absolute statement about it. Each one of them, in her own way, is a teacher to mankind as to what truth and goodness in their many dimensions are. 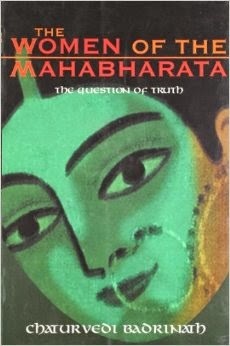 Often when stories from Mahābhārata or Rāmāyana are re-told by most 'modern' or 'post-modern' writers, there is a tendency to interpret or read these stories in the light of presently fashionable intellectual theories, or popular literary fads with superheroes and fantasy. And when it comes to the stories about any of the women in these epics, you have your usual 'feminism' and 'patriarchy' stuff which twists everything to such an extent that the story is often lost in all the interpretation of the re-teller. If at all the re-told story somehow escapes the critical lens of a post-modern feminist reading, it may be over-analysed using the present-day notions of conventional morality or a de-contextualised ethical standard that privileges one side of the truth over many other possible sides. Thus, a human situation and its story has not only several levels but can also be read differently by different persons and even by the same person differently at different times in his or her life. That is why I have not interpreted, nor analysed, any of the women of the Mahabharata I have assembled here. What they are saying, the context in which they are saying it, and what they are as human beings, are perfectly clear and require no interpretation, especially if we keep in mind the method the Mahabharata consistently employs in its inquiry into the human condition. That method itself suggests interpretation, of which there can be more than one. Doesn't this introduction entice you to read the stories that are assembled in this book? I am sure it does! Especially if you are interested in knowing more about what the stories of the women of the Mahābhārata have to tell us about ourselves, our lives, our stories, our relationships, our quest for truth and meaning. They have never been far away from us, Savitri, Draupadi, Damayanti and others of their kind. Of course, a veil had fallen between them and the English-educated Indian for a while. Fortunately, before any lasting damage was done, the Indian intellectual went back to the sources and helped the coming generations draw close to the classical heroines. Romesh Chunder Dutt, Subramania Bharati, T.P. Kailasam; by now Raja Ravi Varma's paintings had also begun to tease the imagination of writers all over India. After the 1950s the 'new' critics took over and feminists bent their eye-brows in irritation at the "Sita-Savitri syndrome" that was keeping Indian womanhood in thrall. No seminar on feminism was free of hot exchanges over the "lakshman rekha" and Indian patriarchy. As the 20th century was drawing to a close, once again there was a change in perception. With the complete text of the two epics available in literal translations, getting back to the original brought innumerable surprises. Well, Savitri never "tricked" Yama; there was no "rekha" drawn by Lakshmana; nor was there any ring in the tale of Shakuntala. As early as 1899, Sri Aurobindo found that basically the Hindu myths were "straight and sheer." It is by reading them in the original setting that we can draw strength from the manner in which Damayanti announced a ruse-swayamvara, the calm with which Savitri questioned Yama, and the derisive way Shakuntala firmly rejected Dushyanta. Critics are increasingly realising that these heroines raise us to higher planes of consciousness. Chaturvedi Badrinath's 12 women prove that one can live in truth with complete dignity and become a role model for all time.